Set-up and manage Essential Rewards online through Virtual Office. Ensure that you always have your favorite Young Living products on hand with the convenience of Essential Rewards, where products are shipped hassle free, and at discounted rates. 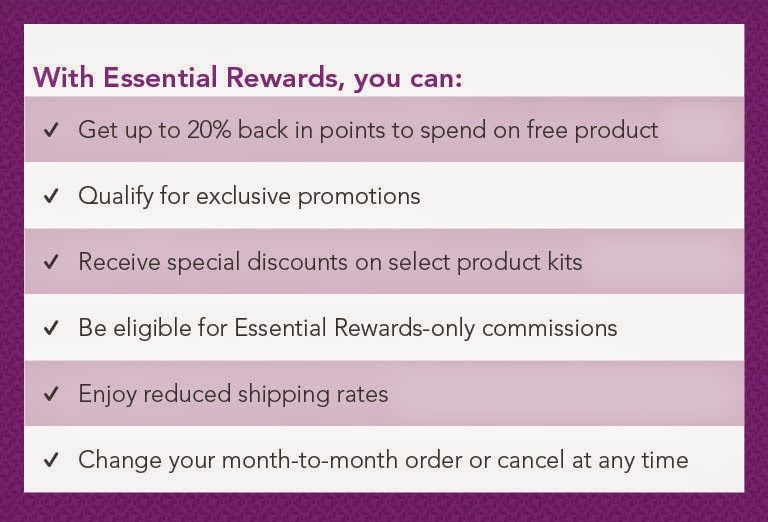 Available exclusively to Young Living Wholesale Members (Independent Distributors), the Essential Rewards program offers many benefits and you can cancel at any time with no penalty. Enjoy the convenience of an automatic monthly order. Just set up your order and kick back as all of your favorite products are shipped right to your doorstep, month after month. Edit your order monthly if you wish to add, delete, or try new products. If you know you will be spending at least 50 PV (ab. 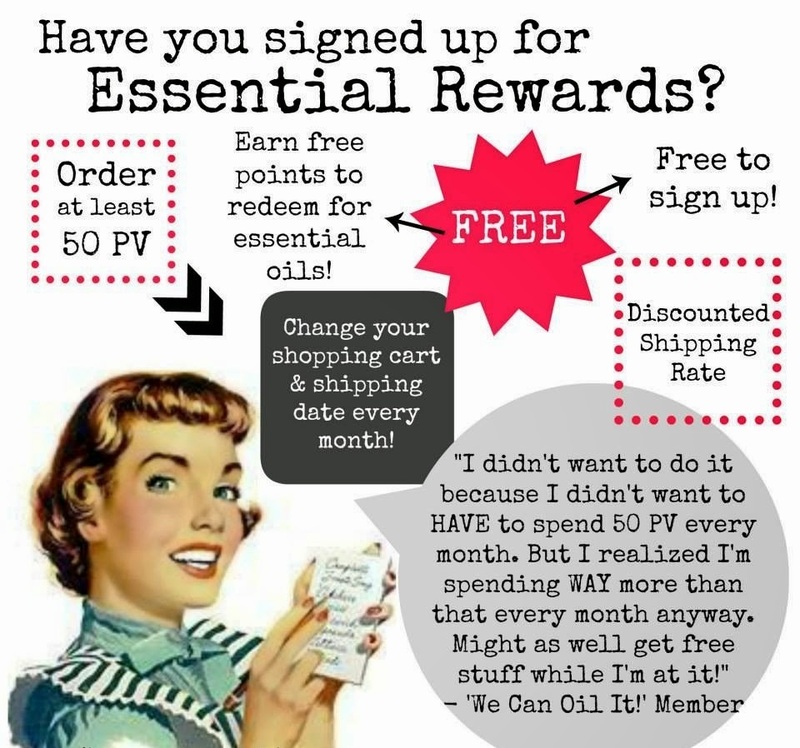 $50) for a few months as you try different products, Essential Rewards is worth it for the free product samples and the Reward Points. Make sure you cash in your points before you cancel. 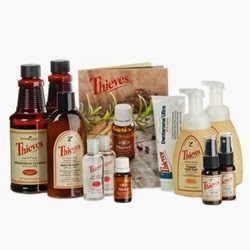 Every month Young Living sends out new and exciting sample products to Essential Reward members. Find out how you can get your Essential Rewards paid for entirely. Earn 10%-20% back in reward points toward future product purchases with every Essential Rewards order. As your months with Essential Rewards increase, so do your rewards! All Essential Rewards orders qualify for reduced shipping costs. Essential Rewards members who are active Independent Distributors can access exclusive income opportunities. For those interested in a home business or a way to get their monthly order paid for through the sharing model, the Rising Star Team Bonus is just one way Essential Rewards members can access additional cash rewards. Learn more about Young Living's Compensation Plan and start sharing these great products with your family, friends, and associates! Independent Distributors are required to maintain an order of a 100 PV per month in order to receive all their commissions and bonuses. Most Distributors consider this a very low overhead cost for owning their own business. Log into Virtual Office and click on "Essential Rewards" instead of "Quick Order". Follow the prompts to place your order and set up your auto-ship date. To manage your Essential Rewards order, simply log back in to Virtual Office. Questions: Find answers in the Essential Rewards FAQ or contact Young Living. 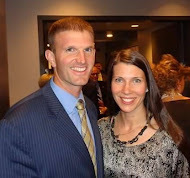 Find answers in the Essential Rewards FAQ or contact Young Living Essential Oils.